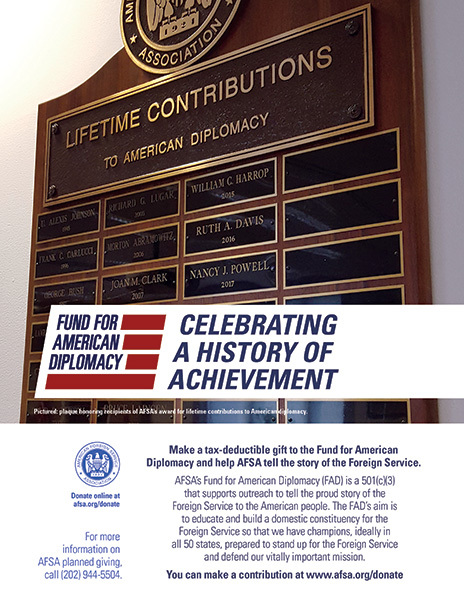 For all of us in the Foreign Service who have hoped that our fellow Americans might one day understand and value our work, I begin with the reminder that the state of the Foreign Service and diplomacy is now front-page news. Let’s take a moment to savor that bump in recognition before I move on to the bad news, the reason why the Foreign Service has become newsworthy. Just as no one thinks much about the oxygen in the air until the rock rolls shut at the cave entrance, so no one gave much thought to the vital work of the Foreign Service in maintaining America’s global leadership until it was in danger. In the face of sweeping cuts, our fellow Americans are now alarmed about the consequences of pulling America’s diplomats from the field. It started with the administration’s proposed 32 percent cut to the Fiscal Year 2018 foreign affairs budget, which would translate into an 8 percent cut of personnel at State and USAID. Although Congress rejected such deep cuts as tantamount to a “doctrine of retreat,” the personnel cuts continue apace, as though Congress had actually enacted a budget slashed by a third. There remains confusion on this point: How can staffing cuts be proceeding when Congress rejected the budget cuts? The bottom line is that staffing cuts continue. In fact, by some reports, progress toward meeting the goal of cutting 1,982 Foreign Service and Civil Service officers and specialists from State’s rolls is running ahead of schedule, even with Congress blocking the planned buy-out. We see this downward trend most clearly in the sheer decline in Foreign Service numbers. The number of Foreign Service officers at State fell by 236 between March and December 2017 (from 8,176 to 7,940). With the hiring freeze still in place at State (though lifted across the rest of the government), we expect the size of the FSO corps to be even smaller when the Bureau of Human Resources releases the next quarterly figures March 31. Entry-level hiring remains at the lowest level since the end of the Cold War, with just 101 new officers scheduled for hiring in 2018, down from 370 in 2016. We see the loss also at USAID, where the number of FSOs serving today—1,685—is well below USAID’s authorized strength of 1,850. The higher an FSO rose in the competitive promotion system, the more likely that officer is to no longer be on the Foreign Service team at State. Of the six officers with the rank of Career Ambassador in December 2016 only two remain. When Tom Shannon departs, State’s four-star ranks will be down to just one. To replenish the CA ranks, our institution will look to the seriously depleted Career Minister ranks, which stood at 33 in December 2016 and have fallen to 18 today, for a decline of 45 percent. The ranks of Minister Counselor, our two-stars, had fallen from 470 in December 2016 to 373 a year later, for a decline of more than 20 percent. These numbers will continue to fall through the months to come. One burning question: Will management restore promotion numbers to normal levels, or repeat last year’s unprecedented cuts? 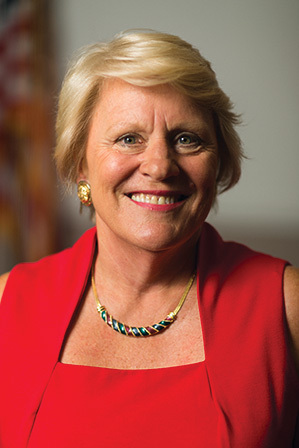 A restoration of healthy promotion numbers is critical for the strength of the Foreign Service as an institution, designed to grow officers over the years by promoting the top performers in an orderly flow up the ranks. It is also critical for mid-level officers, who see their path to leadership blocked by the dramatic reduction in promotion numbers. For example, as promotions into the Senior FS were cut by more than half, the ranks of FS-1s swelled, which in turn dims promotion prospects for FS-2s. America must field an all-star Foreign Service team to deliver wins around the world. Annual spending on core diplomacy, at $5 billion, has already fallen by 25 percent since 2008. (For scale, the defense budget is about $700 billion.) Cutting diplomacy is not about balancing the budget. The National Security Strategy says “We must upgrade diplomatic capability” to cope with escalating threats, so it’s hard to argue that cutting diplomacy is about achieving our national security strategy. So what is the argument for pulling America’s diplomats from the field and forfeiting the game to our adversaries? State VP Voice: You Called?